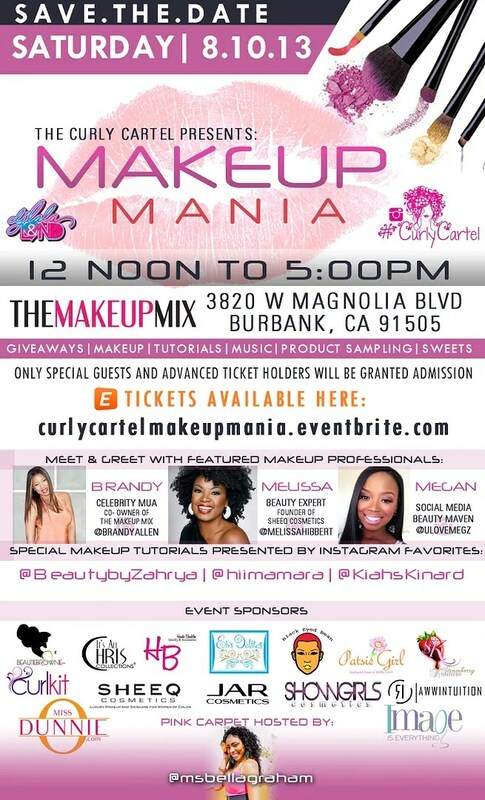 [Event] The Curly Cartel’s Makeup Mania – Hosted by Bella Graham! Hello Lattes! If you’re in the LA area and you’re a makeup artist, fashion blogger, beauty maven or just someone who loves makeup, stop by “Makeup Mania” next Saturday, August 10th! LLL’s Bella Graham will be hosting the pink carpet and interviewing the special guests! There will be panels with beauty experts and celebrity MUA’s including Brandy Allen, the founder of Sheeq Cosmetics (Melissa Hibbert) and social media beauty maven, Megan! The event will be hosted from 12pm – 5pm (PST) at The Makeup Mix in Burbank! Hope to see you there!